You may think that you don’t need resistance training, but you are likely wrong (or at the very least missing out). Resistance/weight training will make you stronger, which will translate into better power output - this means you can go harder and faster. It can also strengthen up your stabilising muscles (core, hips, shoulders, etc) which may prevent you from getting injured. Do I have your attention? Good. When you run (on the trail or the football pitch), you teach your body to get better at it. This is called the “Specificity Principle”. If it’s an endurance sport, your nerves, muscles, energy metabolism, and cardiovascular system get better at endurance (and vice versa for sprinters). But an unfortunate thing starts to happen - both the time you can spend and your ability to voluntarily push yourself harder on the road start to reach a plateau (and so does your performance). You’ve started to reach a ceiling on muscular endurance (oxygen/energy transport) that won’t respond to the “Specificity Principle” as easily as it used to. But if you can’t drive any harder, you CAN build a stronger engine. What does that mean? 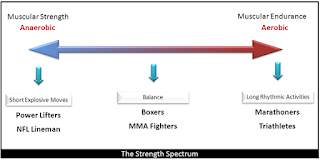 It means that on the spectrum of sports performance, so far your muscle strength is a relatively untapped “weak link” - you still have a huge amount of potential that hasn’t been directly developed. And strength is “the tide that raises all ships” - by increasing power output you should have improved endurance. Moreover, increased muscle strength is beneficial to your stability. If the muscles that brace your knees, hips, core, and shoulders get stronger, you should make yourself more resistant to injuries. This effect is seen with general strength training (squats & pullups), but also with specific stability training e.g. planks & big rubber balls. ● Learn proper technique! If that means reading a book like Starting Strength (Rippetoe), watching some YouTube videos of trainers like Bret Contreras, or getting a trainer for a few months, then do it. It will make your training SAFER and MORE EFFECTIVE. I would suggest doing resistance training two days per week (that can increase with necessity & experience) and training your whole body each session - this means everything gets enough work without being OVER worked. 1. Start off with a general warm-up - this can be a bit of cardio and bodyweight exercises or a few yoga postures for 5-10min. 3. Do 1-2 warm-up sets with a light resistance, then choose a challenging weight for 1-2 ‘work' sets of between 8-15 repetitions -- the set ends when you can’t get another rep with good technique. 4. Next, perform 2-3 secondary or stability moves for the ‘core', hips, and/or shoulders as is appropriate for your sport e.g. runners should do some hip work and a bit of core, swimmers should do some shoulder work and some planks, etc. 5. Finish up with a bit of stretching and possibly foam rolling for any tight areas. Every week you should try to increase the weight used or repetitions performed - this is how you make progress. Just don’t be a dumbass and try double the weight you used last - an increase of 5% is usually plenty. 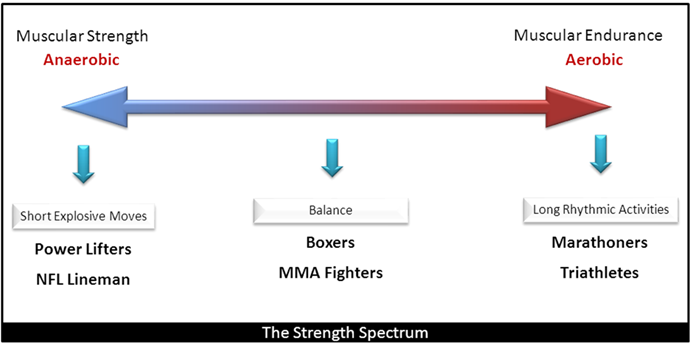 As you gain experience, start working in other rep ranges (see chart above) to focus on specific aspects of performance. ● Strength training is to support your sport: don’t go so hard that it makes you too tired to perform - what’s the point? ● Change it up for variety, but not TOO often: no need to change the exercise you’re using every session - never getting used to an exercise actually deprives you of a lot of the benefits (but maybe change things up every 6-8 weeks). Enough talk - get out there and lift something!